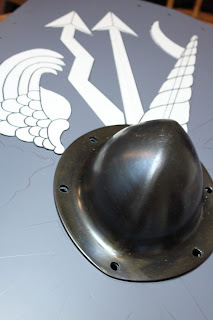 Seems like only I could find a way to connect the modern custom motorcycle paint industry with Roman shield construction. I think I want to call this method "Backwards Anachronistic Compatibility". 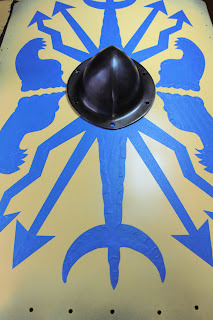 I've never gotten to help make a heavy fighter's shield before, so when my guy said he wanted to fight in a Celtic/Roman kit I knew there might be a possibility for some hot Gladiator action...uh, ... 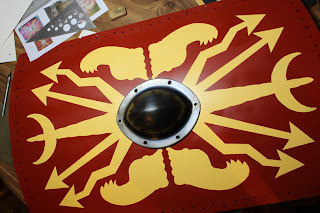 I mean a chance to use some of the motorcycle painting skills I learned in the real world to help create a replica Roman Shield worthy of the rigors of SCA heavy fighting. 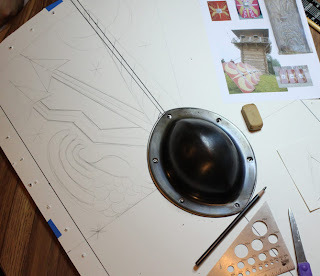 The shield itself is T6 aluminum, which of course needed to be cut to shape and drilled for the leather edge it will need. That was his job, but mine was the design itself. 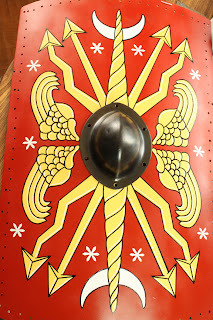 Of course there was much referencing of many photos and various Roman reenactor websites. 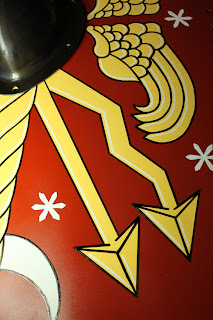 I adapted most of the design from a stylized image of a shield (or scuta) on a bronze Roman dagger sheath. In recalling my brief time working for a custom motorcycle paint shop, I knew taping, paint spraying and pin-striping were the big three skills I'd need. Thankfully he did the actual paint spraying because the smell of most paint gives me a headache for a day now... which is one of the reasons why I don't paint motorcycles anymore. The first thing to do, after the surface had been primed, was to create a posterboard template so that I could trace it on all four corners of the scuta. It helped to have the center boss in place. Here you can see the templates with the details drawn in. I actually used the reverse piece of posterboard that these were cut out of to trace the outline in pencil over the whole scuta. Then he sprayed the yellow color all over it, making sure to cover the areas of the traced designs. Then I re-traced the template, over the yellow paint. Then I cut 1/2" blue painter's tape into thinner strips and taped all those little curves by hand. After filling the larger areas with full size pieces of tape, I burnished it all down to avoid "spray-under", just like I was taught by the old school cycle painters. Then he hit the whole thing with red paint. It took a few coats, even with the primer, to get it looking evenly red...and then we pulled off the tape. It was starting to look Roman! Another tape session needed to be done for the moons to make them white. More taping around curves and sheets of newspaper were used to cover most of the shield. It took two sessions to outline and detail the lightning bolts, wings, horns, moons and stars, using paint pens instead of pinstriping brushes. Pinstriping was never my strong suit anyway. You can't really see the white details well in this last photo, and it still needs a leather edge, but the whole thing sure looks nice. Too nice, in fact. I can't wait to see it scratched and dented up from fighting. I probably wouldn't have been able to paint this nearly as well had I not taken that job painting bikes. I have no idea how they must have done this in the Roman period, but I know they didn't have spray paint, posterboard, painter's tape or paint pens. Or T6 aluminum. So this is probably significantly lighter weight than a true Roman scuta. It is being clear-coated as I type this (cough, cough), and it should be fun to go to fighter practice this Tuesday to see who lines up to hit it. And for the record, no, I'm not taking orders. That's why I posted the process, so you can learn to make one of your own.